Friends of Graphic Design at PSU: This is how we do it. Obligatory Cat Video/ Best Coast/ "Crazy For You"
This is, after all, the internet. Enjoy. This week our very own Nicole Lavelle has made it to the big times on the cover of Willamette Week for their Cheap Eats issue!! Nicole worked worked with Willamette Week to do a fabulous cover and a rad editorial image on the interior. Be sure to pickup a copy and congratulate Nicole on an awesome job! Yeah!! We welcome Jill Bliss as our latest This Is How We Do It installment. Jill visited my 210 illustration class a few weeks ago and also spent time with other PSU classes. She was lovely and amazing and I am keeping my fingers crossed that we can snag her to teach a class or two. Please check out her website and also read an interview with her over at My Love For You Is a Stampede of Horses (one of my favorite blogs). On to a list of Jill's favorite tools! uniball deluxe micro for black lines, zig archival pens for colored lines. i feel naked and anxious if i don't have a pen on me at all times, it's one of the reasons i carry a bag. the other reason i carry a bag. again, naked and anxious without it! where would i be without the ability to scan my drawings?! although i have gotten pretty good at drawing simple lines with my right hand [i'm left-handed] and the thumb pad, the wacom makes it soooo much easier to fill in details on my scanned drawings. especially the magic wand, cut, copy, paste, color overlay, and paint bucket tools. you've seen it at the art store: clear plastic with a red grid. an indispensable tool from my fashion industry days. it makes math and measurements visible and understandable, so handy to see the things you're measuring through the ruler sometimes. each square on the ruler is 1/8." so, you want to cut 1/2 off a print? lay the ruler over the print so that 4 squares overlap your print and line up with the existing edge, and cut. voila! no need for t-squares or taking measurements and drawing little lines to line up your ruler with before you cut. they even make these rulers with a metal edge to make cutting lines a snap! some of it is so beautiful or cute i want to eat it! but instead i'll make things from it. industrial straight stitch sewing machine. this baby will sew through just about anything without complaint. i'll never go back to a home sewing machine again! ok, this isn't really essential but i love it enough to haul it around everywhere i move to. both industrial machines require me to hire movers, and it's worth every penny. indispesible for making limited edition paper and fabric prints and products! dual slide compound miter saw with laser. this baby cuts small pieces of wood i use for art pieces and such. it can do 90, 45 or any other angle you want in a snap, and makes cuts up to 12" long. it also has a red laser beam that shows you where it's going to cut before you cut, ooooh! some day i'll get a table saw, but for now this little guy and a jig saw with a c-clamped ruler as straight edge guide do the trick in most cases. or i have the guys at the harware store cut down standard 4'x8' panels for me at 50 cents to $1 per cut. Meg Hunt wants to share with you almost an alphabet full of tips, tricks and hints. Meg was our special guest in 210 a few weeks ago and she zoomed these words over this weekend. THANKS MEG! a. Colored pencil, either mechanical or Col-Erase. I use these suckers all the time. Though I also use mechanical pencils (specifically the Papermate Sharpwriters-- I love these pencils! ), those are relegated to thumbnails and concept sketching when I can afford to make a mess. The colored pencils erase well when I make mistakes but rarely show up when I convert my inkwork to Photoshop. Which means I don't have to erase my inks and risk smudging or fading. b. Inks. I love inking. There's something really fun in taking a rough and tumble pencil sketch and pushing and pulling darks and lights with ink. So I use black and white ink-- I use a few black inks, but an old favorite is Dr PH Martin's Black Star Ink in Hi-Carb. White I have found good success with Pen-White (also by Dr Martin). c. 'inkwell'. Okay, I'm not sure whether it's an inkwell, but my dad gave it to me as a stocking stuffer when I was a kid-- I think it's a tiny Russian lacquer box. At any rate, it turned out to be perfect to hold a few dropperfuls of ink. Which isn't all that useful for dipping nibs into, but I'm accident-prone and have ruined a lot of brushes so it's great to be more mindful to not dip the brush too deep. And I lower the risk I will knock the ink bottle over anyway. For white ink I use a juice cap, but one day I hope to find another one of these suckers. d. Brushes. I have a bunch of brushes. Some are broken in and beat up and others I try to take good care of. I love the brushes I get from Rosemary & Co-- affordable and handmade! e. Sturdy paper. Typically smooth. If it's for screenprintin', I order French Paper. If it's for making illustrations, I use bristol board (usually Strathmore 300 or 400 series, plate surface, 14x17"). I am frugal so I gang run multiple drawings on every page. Not especially framable, but it does the trick. Ward Jenkins: This is How We Do It. Ward Jenkins wants to tell you his 9 favorite tips and tools. Ward is also our special guest in 210 today too! WHEEEE! Thanks Ward! Ward is an illustrator and animator and just wrapped up his first children's book. Check out his links---> Blog, Work, Interview on Design Inspiration. He is a contributing editor at Drawn! as well! Oh, yeah and he also has an amazing collection of vintage and mid-century modern children's book illustrations. Peep those in his flickr sets. 1. Carmine Red Col Erase pencil - A (somewhat) standard among the animation industry, I still use this type of colored pencil for sketching and animating because of the fact that you can erase fairly easily (although I've been very bummed out by the quality of the lead & eraser ever since the name on the pencil changed from 'Sanford' to 'Prismacolor' several years ago). I used to draw in blue, but switched over to red when I realized that the scanner (and camera for penciltests) picked up more of the red. 2. Scanner! - My dream is to have a large bed scanner some day. I've got a regular 8.5x11in. bed right now and animation paper is much larger which bums me out immensely. 3. Delete whites action in Ps: this is a Photoshop action created on my own after finding out about it when I worked at Primal Screen. It basically does what it says: deletes all the whites on an image without leaving behind an ugly white 'halo effect'. Some have asked me why not use the 'mutiply' layer effect instead, since that kinda does the same and to them I say, 'phooey'. It certainly does not do the same. I explain some of the action on this post: http://wardomatic.blogspot.com/2005/06/how-to-on-black-white.html -- I plan on going into more in depth detail about this later on on my blog. Soon, I promise. 5. Chalk brush tool - I cannot live without this one. 7. Command U - Changing of hue/saturation: My theory is that colors like to play well with each other. Especially if they're from the same neighborhood. So, working with hue, saturation, lightness, etc. becomes this game I play with the colors on a constant basis. Lately, I've found that I'm starting to play with stronger, more saturated colors than I used to. Which is nice. 8. Sketchbook is imperative: (sorry, Frank, but I gotta have mine) any ol' sketchbook is fine, from the über-nice quality of Moleskine to the $5 garden variety you find at your local art supply store. As long as there's some blank paper, it's good to go. I try to take it with me everywhere I go, so I can record interesting scenes, buildings, people. Mostly people. When I was taking the bus on a regular basis, my sketchbook was my best friend. It became my own visual journal, as I can go back and see what I was doing during a particular time. Any thoughts or ideas that pop in my head, I'll write or sketch them down. Later on, it helps to have these sketchbooks readily available in case I need some inspiration for an interesting character I'm currently working on, or for a location, etc. It becomes my own in-house resource. But with the Ward-filter to guide me. 9. Sense of humor: Especially when dealing with various clients and art directors. Gotta keep a sense of humor for all the crazy things that might come up -- if you're easily ticked off then being an artist/designer/illustrator is probably not the best career choice for you. One thing I try to do is stay away from actions, effects & filters that make the piece I'm working on look too 'computer-y' or 'photoshop-y'. I'll go out of my way and do certain things manually, even if it takes longer (like shadows, textures). Basically, it's about aesthetics for me. I always try to keep the human element intact with each illustration I create. That's why I still draw on pencil. On paper. I've tried out the Cintiq for inking and lines, but it's not enough for me. I'd rather have more control over what I draw with good ol' fashioned graphite & wood on paper. Going the paperless route is not an option for me right now. Sorry, trees. I still love you, though. Okay. I'm done. Hope that's enough! Thanks for listening. Welcome to the second installment of This is How We Do it (TiHWDi, as I like to call it). On deck is Maker Frank Chimero! Save the Date, by Frank Chimero. I asked Frank what some of his favorite tools/tips were and he is generously sharing them with us! I hate expensive tools. I'm scared to use them. Does your grandma have one of those sofas with the plastic cover on it that you're not allowed to sit in? That's how I feel if I buy a nice new sketchbook, or spend money on fancy nibs for a pen. So I buy cheap stuff. Because ideas are cheap, and you can't be too scared of your tools. You have to bend them to your will. I don't use fancy tools, but these are my most frequent. I don't believe in sketchbooks. The only one I have is a tiny moleskin, and all I do is write in it. For sketching, I have a three-ring binder with hole-punched copier paper. Cheap, awesome. And, you don't feel bad documenting your bad ideas, because, c'mon. It's cheap paper. Getting the first, awful ideas out of the way is crucial for me, and if I document them on paper, I feel like I've acknowledged it and can move on to better things. If I had nice paper and a nice sketchbook, I'd be paralyzed to make the first idea good or great. 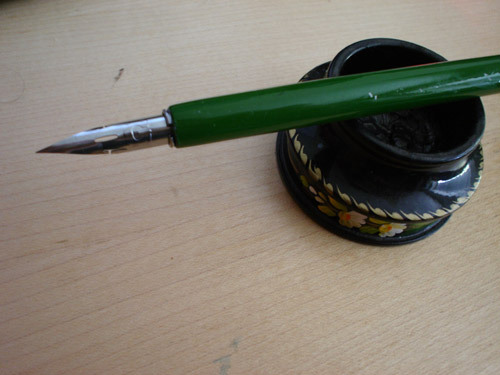 Writing and drawing utensil of the gods. Did you know that the Declaration of Independence, the Magna Carta, Huckleberry Finn, and the first draft of Wuthering Heights were all written with an extra-fine tip sharpie? For truth! I love these little things. They're cheap, so I don't feel bad losing them. They're writing point is small enough to do tinyish drawings, but they bleed just enough to keep me from getting too much detail. The less detail the better in my sketches: it forces me to focus on content and the central idea I want to communicate. There's something magical about scissors. I don't know what it is, but it makes your mind work differently. Cut paper out. Glue it together. Simplify things with a clumsy tool. Turn things upside down. Or just hold a pair of scissors and pace while you think. Just the right amount of danger, no? In all software. To undo is to forgive. I'm forgiven. Hallelujah. I make shapes out of other shapes. It's really handy, and gives me a nice structural, simplified look to my work. If everything is based off of geometry, it always comes together so harmoniously. I have music pumping all the time, and I'm SUPER fickle with what I'm listening to. Just comfortable enough to relax you. Not enough to have you fall asleep. Right before you fall asleep, your brain is making connections between all of the unrelated thoughts in your brain. There's no filter in your conscious mind saying "This makes sense and is acceptable. This does not." Without that filter, you can consider many more possibilities. So, grab your sharpie and some cheap paper, and fill your mind to the brim with research and what you already know. Then, take an almost-nap and get ready to document the ideas that come rushing in. Anything that's good comes from editing. Delete unimportant things. Even if you love them. Sometimes you have to kill puppies. Delete. Refine. Edit. Improve. New Q&A Series: What Tools Do You Use? aka This Is How We Do It. I have decided to start a new series partially inspired by my Digital Illustration class this quarter. We have been looking at a lot of illustrators and we have also been trying to figure out the best way to use photoshop, illustrator, pens, pencils, paper, brains and bodies - essentially learning about tools and the best way to use them - along with learning to generate awesome ideas and concepts! Everybody uses different things to get to their desired results so I was curious and have slowly started to ask designers and illustrators that I respected about the tools they use! I am going to start the series with an interview by my former professor from undergrad and an interview with a former student of mine. Full circle! Let's ROLL! 4. Photoshop layer blending modes and layer masks. 5. healthy environment...declare your creative space. this has become very important to my ability to make anything. If possible, having a separate space to live and create will get you a starting spot on the '92 dream team roster. If you want to share your tips, tricks, tools please do so! Email ME. I would love to know! You might even find yourself on the blog!